At the University of Trier, the IRTG Diversity cooperates with the Trier Centre for Canadian Studies (Zentrum für Kanada-Studien, ZKS), and the depth and width of the work that is done by members of the ZKS can be observed, amongst other things, in the Canadian Studies classes that are offered every semester. 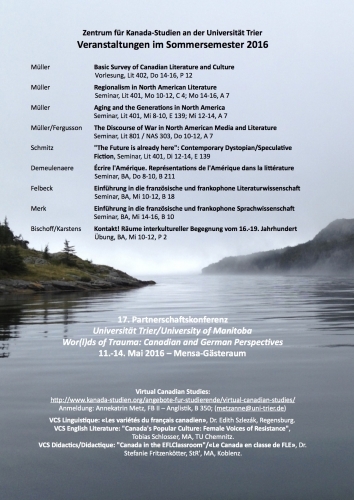 In the upcoming summer term, students at Trier University who are interested in Canada can again choose from numerous courses on English-Canadian literature and culture, Quebecois and Francophone Canadian literature and culture, linguistics, and international history (see the poster posted here). In addition, the Trier Centre for Canadian Studies is hosting an international conference in May, and there is the opportunity for students to join a Virtual Canadian Studies class.